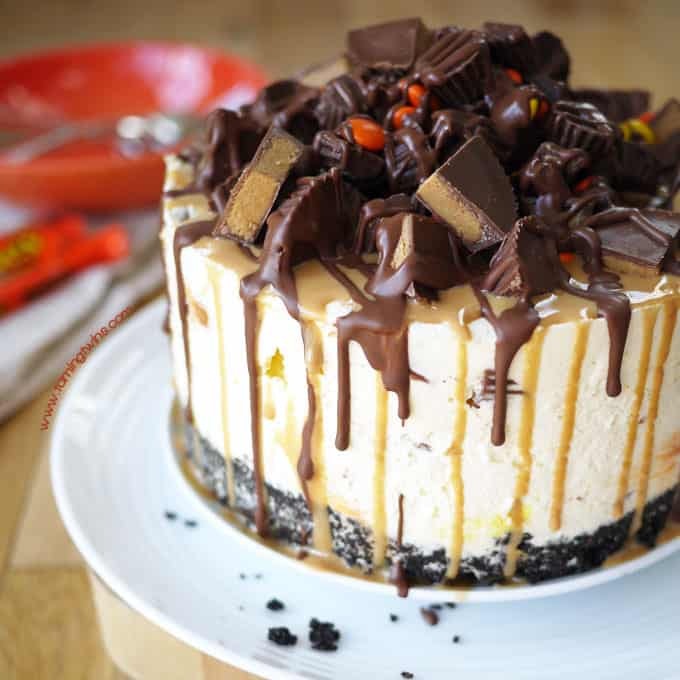 The ultimate no bake Reece’s Cheesecake – with a crumbly, peanut butter Oreo cookie base, stuffed with peanut butter cups and Reece’s pieces and topped with lashings of peanut butter sauce and chocolate. Why is it, that just when I’m trying to eat a little bit more healthily and cut down on sugar, genius ideas for deliciously decadent desserts come to me? Sometimes whilst I’m on the treadmill, how cruel is that?! My peanut butter loving Mum came to stay recently and I wanted to make a bit of a showstopper to say thanks for coming to help us for the weekend. 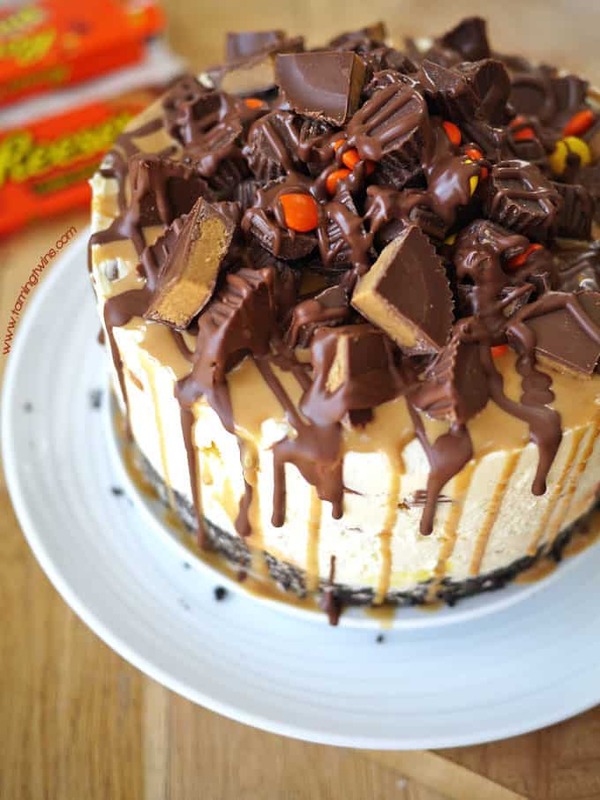 (We have been Marie Kondo-ing, that’s a whole blog post in itself) So this Reece’s cheesecake was born. It’s based on my most popular recipe ever (over a million views – eek!) my Creme Egg Cheesecake recipe. Clearly, this is not diet food, and is not part of my Slimming World plan. Also, I’m not the biggest fan of Reece’s peanut butter cups, the ingredients list is a bit suspect, sometimes they do just hit the spot though and everything in moderation is all good am I right? Oh and, PEANUT BUTTER and OREOS and CHOCOLATE though. Be still my heart. When whipping the cream, be sure to watch it very carefully. It should be just forming soft floppy peaks, but still hold it’s shape. Too running and the cheesecake will be sloppy, too stiff and it will be too dense. 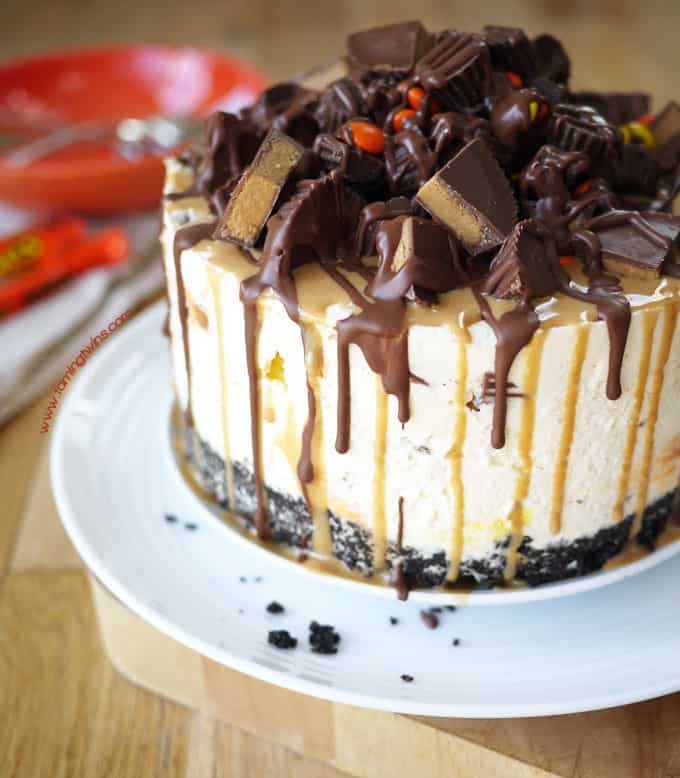 You could add 150g of smooth peanut butter to the cheesecake mixture itself, I think this would add a deeper flavour to it and be a great addition. Annoyingly, I’d run out when I made this! I would stick to Philadelphia creme cheese for this Reece’s Cheesecake (and full fat) it seems more stable than supermarket own brands. The recipe is for a 7″ wide and very DEEP tin (not a standard sandwich cake tin, it will overflow! See the link below for the type of tin I use). You can use smaller or larger but your cheesecake will obviously be taller or shorter. Hope you enjoy making this as much as I did. Please tweet me a photo if you do make it! You can find me on twitter @tamingtwins and Instagram @tamingtwins. Say hello! Follow me on Facebook if you’d like to know as and when I post more cheesecake recipes. The ultimate no bake Reece's Cheesecake - with a crumbly, peanut butter Oreo cookie base, stuffed with peanut butter cups and Reece's pieces and topped with lashings of peanut butter sauce and chocolate. 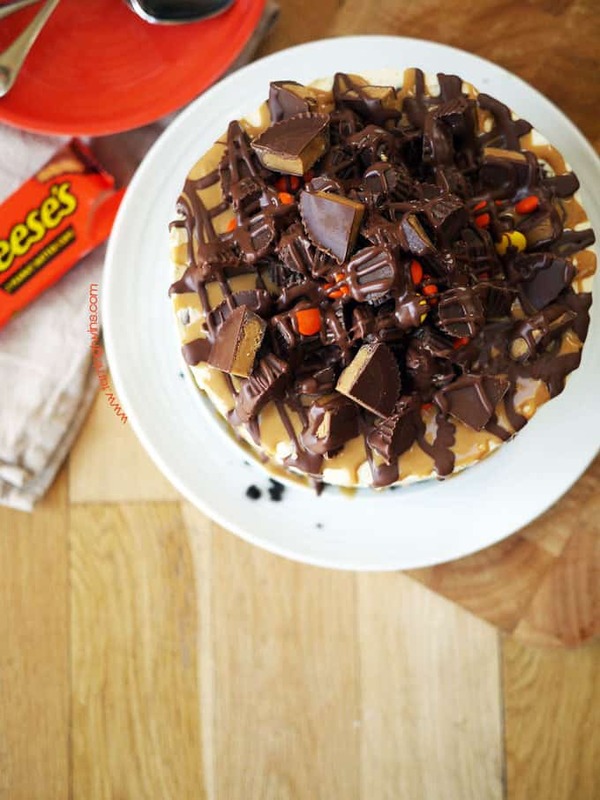 Unwrap Reece's Peanut Butter Cups and chop 4 of them into small pieces. Combine the whipped cream, icing sugar, cream cheese, lemon juice, chopped Reece's, 1 bag of the Mini Reece's Peanut Butter Cups and one box of the Reece's Pieces. Fold in gently until fully combined. Chill for 3 hours or even better, over night. Drizzle enough of the Reece's Topping over to cover the top and create some pretty drizzles down the sides. Melt your milk chocolate in a glass bowl over a pan of boiling water and allow to cool very slightly before drizzling over the cheesecake in zigzags. Hope you enjoy the recipe, feel free to click the share buttons below to show it to any other peanut butter fans in your life! 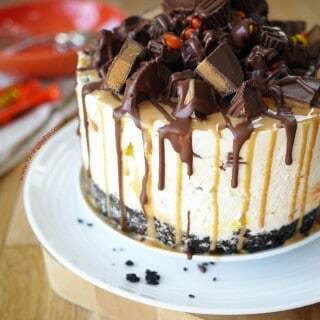 Pin the Reece’s Cheesecake recipe for later..
« Motorhomes – Camping for People who Hate Camping? Could this LOOK any more delicious… OMG!